iOS 8 will be released to the public very soon with its myriad of new features and enhancements, and that makes now a great time to prepare your iPhone, iPad, or iPod touch for the major system update. 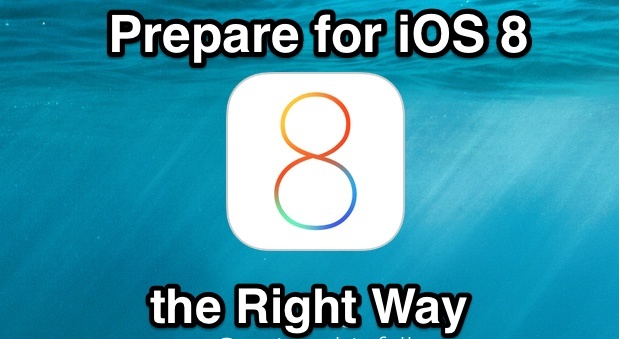 We’ll break it down into several easy steps so that you’ll have your iOS device ready to install the latest version when it arrives in the near future. If your iPhone, iPad, or iPod touch isn’t on the list, you won’t be able to run iOS 8… yes you’ll miss out on some of the latest and greatest features, but that’s not necessarily a bad thing in some ways, as we’ll address in a moment. It can also be a good excuse to update to the newest hardware, the iPhone 6 looks pretty awesome anyway, doesn’t it? Some devices can’t run iOS 8 because they’re too old. But just because a device can technically run the latest version of iOS, that doesn’t mean it should. There are so many examples in iOS history of older hardware slowing down dramatically once it has been updated to the latest version of iOS, and that should serve as a meaningful consideration that for some older devices, it may be best to just skip the update completely. We gave this advice for some hardware with iOS 7, and we’ll offer it again here. This is entirely a matter of opinion, but it’s my recommendation that old hardware should think twice about updating to iOS 8 (and iOS 7 too if you happen to be on iOS 5 or iOS 6 still with that old iPad 2 or iPad 3). This is particularly true for iPad 2 and iPad 3, the latter of which really crawls with iOS 7 as is, and while it’s possible that the final version of iOS 8 will offer some performance improvement over iOS 7, thus far it hasn’t surfaced. We’ll certainly update if that changes, and if the GM version really flies on even the oldest devices, that’ll be fantastic. If you want the latest and greatest features, go ahead and update that dusty old hardware to iOS 8 anyway, but be aware that performance could be hit as a result. And once you update to the latest version of iOS, you have a very small window before downgrading becomes impossible. Before major iOS updates is a good time to clean house and uninstall those apps which you don’t use regularly. Opened HyperLapse once and never touched it again? How often do you really play Flappy Birds anymore? Is Garageband going unused for months on your iPhone? If the answer to how often an app gets used “never” or “rarely”, just delete it and free up some space on your device as a result. 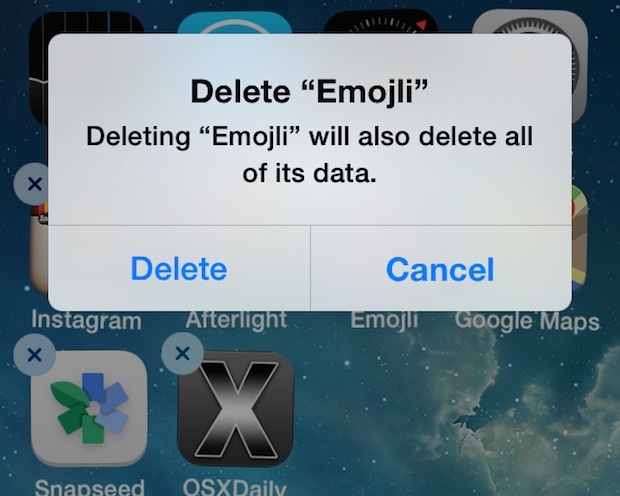 Now that you’ve deleted the apps you don’t use anymore, fire up the App Store and update what you have left. It’s a good idea to keep apps updated in general, but it’s all the more important with new iOS releases, since major updates are necessary for compatibility but also to add new features that derive from the new iOS version. Yes you’ll have to update some again once iOS 8 actually ships, because many apps that are updated for iOS 8 will include extensions and widgets that are not compatible with prior versions. It’s a good idea to back up all of your stuff – no not just your standard iCloud or iTunes backup, though we’ll get to that in a moment – but your actual stuff that really matters. Usually that means photos and videos. Take the time to transfer pictures from your iPhone, iPad, or iPod touch to a computer, a process which typically will copy your personal movies too. You can always download an app again, but can you take the same picture and capture the same moment again? Probably not. Back this stuff up, it’s important. Finally, back up your iOS device and all of it’s settings and customizations. 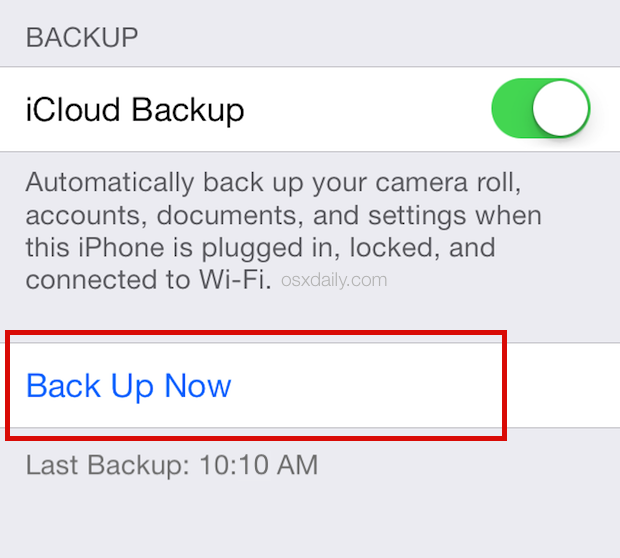 This is easy, and you can do it through iTunes or iCloud, or ideally, back up to both. Backing up should really be part of your regular routine by now, but even if it’s not, always – always – back up your iPhone, iPad, or iPod touch before installing any major new iOS update. This insures that if something goes wrong, you can easily get everything back to normal again. Backing up is arguably the single most important thing you can do to prepare for any iOS upgrade, so do not skip this. All done? Congratulations, you’re ready to update to iOS 8! Good advice. Now some (kindly meant) for you: ‘it’s’ is the contraction of it is’. Revise and edit your article with that in mind and it’ll be even better. Isn’t it also a good idea not to immediately update since it’s usually the case that a bug is found and an update is usually issued within a few days. Agreed. I never do the update until at least the X.0.1 version. It’s a software update, not the second coming. Yet with Apple it’s like ordering dinner at a restaurant and having to cook it yourself. Also what I have found in the last couple updates is use your computer. Don’t OTA update as I have found these tend have more bugs in the install. Great list though. I always just back up my stuff. Back up my iPhone. Then do the update. Have had it go fine most of the time, got stuck and had to restore once, exactly why you need to back up!! 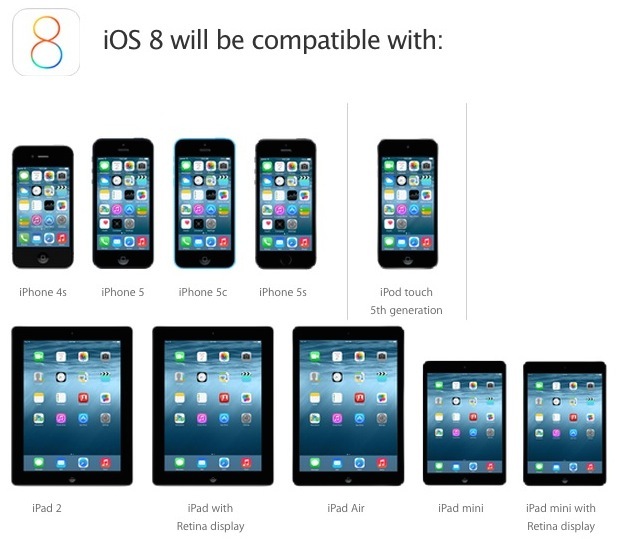 iOS 8 sounds ok, incremental as usual. Kind of been that way since iOS 4 though, little things here and there. The hardware is the real update, very excited about a new iPhone with bigger screen and better camera. Editor Alert… There’s a typo in the first sentence of this article: ‘it’s’ should be ‘its’. Use in conjunction with ‘myriad’ is questionable. I have an IPad Air, I had iPhone 4′ when they did minimal updates and brought the next model of phone out, I decided the cost of a new handset not worth the hard wear change, I bought Samsung galaxy four, terrible mistake, I hate the bloody thing, but going back to the iPad Air, 16gb wifi. When Apple last brought update, it almost left me with no space, this is stupid, do they not think of this? It’s about time they give us connectivity and sd card upgrades for this valuable space, we’re not going to keep paying a few hundred pounds for minimal space, no one is this stupid, even though we support apple, there’s a limit to how much we put money into these projects. I’m looking very close at iPhone six, and hoping they give us micro storage, this is now important in a economy where people can’t keep throwing hundreds of dollars, so this years hardware upgrade is very important to me, I have imac 27 which is brilliant piece of kit. © watching closely!!!!! Hope you get it right Apple!! I never found my iPad 3 to be crawling on iOS 7. If things weren’t the same, they seem snappier. I agree with Nick … I use an iPad 3 extensively with iOS 7.1.2, I have over 70 apps installed, keep a t least a few movies and tv shows loaded and don’t experience any slowness or lack of performance as compared to when I was using iOS 6.x. Though I do understand that technology moves forward, I’m hoping iOS 8 will offer similar results. I get the suggestion about not updating to new iOS if you have older devices – which is my situation (iPad). But what about downloading latest iTunes update — 11.4 — if I download that on my desktop, will I end up having problems when syncing to said iPad? I have an iPad 2 and it ran iOS 7 very well… I must say that the iOS 8 betas were indeed slower, but I hope it will be better once it’s released officially.